We were to create a logo and website in order for people to find and book the accommodation online. We came up with the logo shown above. The Lodge is surrounded by Barlay wheat fields, something which is referred to in the name of the property. We thought this would make a nice symbol to go with the logo, which was created with Adamina, a smart but welcoming serif typeface. The website was to include a calendar and booking system. This comprised the bulk of the work, but other features included a guestbook, facebook feed, quick contact portlet, a gallery of images and lots of information about the area, local attractions and of course the accommodation itself. As well as coding the calendar/booking system, a lot of thought went into the visual aspect of the calendar . The client wished to rent out the accommodation for one week periods from Friday to Friday, and had a 3 scale pricing structure for the different seasons. We therefore had to come up with a neatly designed and colour coded calendar to structure and display all this information as clearly as possible. Having included a quick contact form on all pages we also decided to add a captcha (''Completely Automated Public Turing test to tell Computers and Humans Apart'') to the form in order to prevent the client being inundated with unwanted messages from spambots. 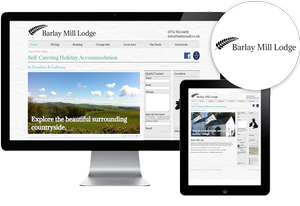 If you fancy visiting a lovely part of Scotland and relaxing in a welcoming and cosy cottage, visit Barlay Mill's website today and book your holiday!